ALCS Game 3 Primer: Jarrod Dyson’s comments/confidence, why Jeremy Guthrie, and revisiting predictions. And while it’s close, the issue is that in that scenario, a weather cancellation causes joy. In yesterday’s case, the weather caused sadness. To me, it felt more like all of Kansas City was waiting to hear back from the doctor’s lab concerning some blood work. Anyway. That was yesterday. And this is today. 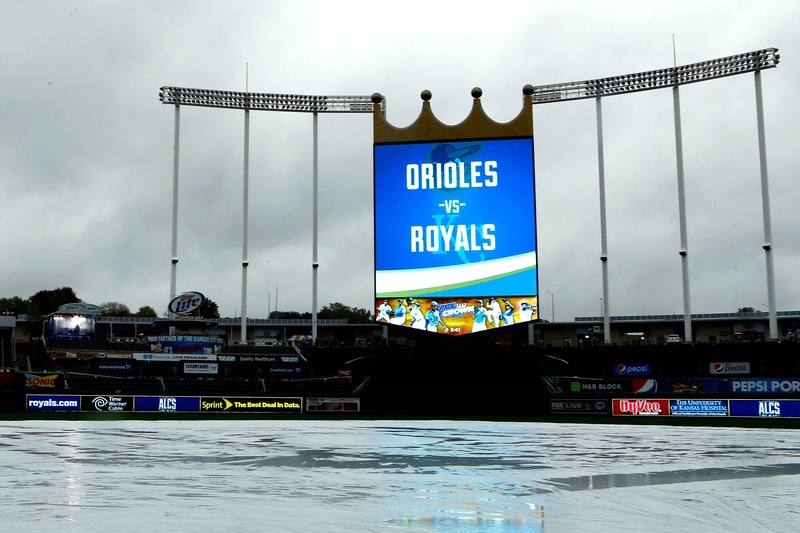 And there will be Royals baseball today. And tomorrow. But probably not Thursday. Because, like Jarrod Dyson, I’m certain this series isn’t going back to Baltimore. When the game got cancelled last night, my wife and I decided to grab dinner out in Waldo instead. From our table I could see three different TVs, and two of them had a headline concerning Dyson’s recent comments. PTI was debating it. ESPN was highlighting it. The Royals are everywhere, man. If you don’t know, Dyson was interviewed over the weekend and made the not-so-outlandish claim that this series wouldn’t be going back to Camden Yards in Baltimore. The media, probably grappling for some sort of controversy surrounding the Royals, are milking the comment for every ounce of drama they can. Can we all agree that this is dumb to make a big deal out of? It is. For two reasons. First – realistically speaking – it makes a lot of sense: Royals are up 2-0 and need to win 2 of 3 at home. Two of the games are against the Orioles 3rd and 4th best pitchers, and the other one James Shields is starting for KC (this could all change if Ned Yost decides to throw Shields in Game 4 after the rainout). You gotta like the Royals’ odds to win two of those three. They’ll be favored in all three. No way! Dyson answered like anybody else would: with confidence in his team to get the job done over the next few days. Speaking of confidence, it’s remarkable that we are all so confident in Jeremy Guthrie going into Game 3. It was about two months ago that most of us were calling for a Shields/Ventura/Duffy/Vargas rotation with Guthrie in the bullpen or simply left off the postseason roster. Instead, we are giving him the ball in the ALCS without many – if any – qualms about it. What you may have missed is that the Royals sent Duffy to the pen instead because he apparently has some mechanicals issues in his windup and gets to jacked up on adrenaline in big games. You may have also missed a terrible September by Jason Vargas in which he went 1-3 and posted a 6.57 ERA. You may have also missed that Guthrie looked like a different pitcher in September too: 3-1 record with a 2.40 ERA. More on “why Guthrie?” from Fangraphs here. Guthrie will be pitching against his former team, whom he has pitched well against in the past. The Orioles hit more HRs than anybody, and Guthrie gives up a lot of HRs…but he’s never given one up to the O’s. Interesting to note that Vargas started Game 1 of the ALDS against his former team too. Maybe Ole Ned likes his odds against former squads. With the rainout last night, it’s possible that Yost could move Shields up to Game 4 if he wanted. It would also free up Shields to be available in the bullpen in case this series went 7 games. Personally, I’d let Vargas pitch tomorrow anyway – especially if we win tonight – to get him some confidence moving forward, and to keep this preferred ordering moving forward into the World Series. All that to say, I’ve got a lot of confidence in Jeremy tonight. And a lot of confidence in the Royals taking care of business at home this week. Okay last thing: let’s check in on my so-called “wacky” ALCS predictions. Prediction1: Steve Pearce has a miserable ALCS. Pearce is 0-9 in the ALCS so far. Prediction 2: Kelvin Herrera gives up a singer to Adam Jones in Game 1. I’d like to expand this to the whole series. In both games so far, Herrera has been in to face Jones, and has bested him each time. Let’s hope that continues. This is a key matchup, and I hope KC keeps winning it. Prediction 3: Eric Hosmer regresses. Alex Gordon goes off. This was certainly correct in Game 1. And certainly incorrect in Game 2. Gordon hit a HR and made a huge defensive play in Game 1. He went 0-4 with 4 Ks in Game 2. Prediction 4: Christian Colon will be a hero. Not yet, but there are more games to play. Prediction 5: Royals advance in 5. Looking pretty accurate so far. Let’s get it done at home over the next three days. See you at The K tonight. Image: Getty Images. Accessed here.